If there’s one thing I’ve learned that is critical to a happy, healthy life, it’s reducing and managing stress. It seems hard to really emphasize the importance of managing stress because everyone experiences it and it’s easy to think of it as normal or “just part of life”. Good thing there are plenty of ways for us to de-stress. Here are my 6 personal favourite strategies! Rituals give us something to look forward to each day. They also provide us with a sense of routine, orderliness, and calm. Pick a time of day that you would like to create a ritual around, this is usually morning or evening, and envision this time of day. What would make you feel at peace? What would make you feel relaxed and happy? What would bring you joy? Write it down. I love having a morning ritual. I always look forward to opening my blinds, knowing I have a (somewhat) organized to-do list so I’m not overwhelmed for the day, going downstairs to make a nourishing breakfast, drink a glass of water, or boil the kettle to enjoy an herbal tea. Having an agenda and writing in it morning and night helps me stay organized and reduce stress for the rest of the day. I really believe that one of the keys to happiness in life is always having something to look forward to, and that doesn’t have to mean extravagant vacations or purchases. In fact, it’s usually the opposite: it’s the little things we do all the time that bring us regular doses of joy. This may be your morning coffee, a podcast you listen to on your way to work, the next chapter of a book you can’t wait to come home to, spending quality time with your kids or a date night with your partner (I’m talking the kind without phones and screens between you), or going to your Sunday yoga class. Once you’ve decided your ideal ritual, do your best to take steps and carve out space to make that possible! There is always wiggle room in life to make space for things you love. 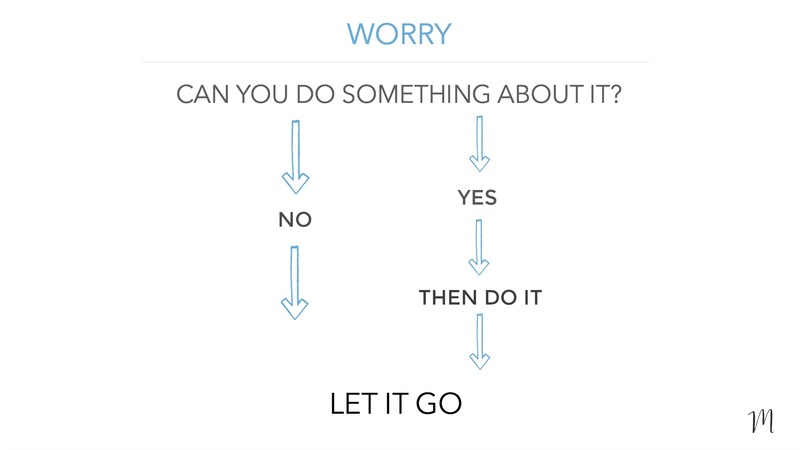 This flowchart can help us understand when to let things go and stop dwelling on them. If there’s nothing you can do about it, let it go. But if there is something you can do about it, do it! Albeit not always easy, it’s as simple as that. It’s imperative and supremely liberating to take care of the root of our stressors so we can move on. We all know how it feels to walk through a forest, by the beach, sit on a dock at a cottage or spend a weekend camping. Unplugging from our hectic schedules and day-to-day responsibilities and reconnecting with the stillness of nature is one of the greatest ways we can very quickly reduce stress. Nature has all the time in the world and we can learn so much from it. It’s always available to us and even a few minutes spent around trees, water, or fresh air can help us find a new sense of self and feel refreshed or re-inspired. Turn off your phone and spend a little while alone in nature if possible. Even your backyard will do! Long, slow, deep breaths are one of the quickest and most effective ways to calm down the nervous system. Deep breathing activates our Parasympathetic Nervous System which is responsible for “rest and digest”. This state reduces blood pressure, slows the heart rate, relaxes muscles, calms the mind, and prepares the body for resting and digesting! Inhale 4 seconds, hold for 1 second, exhale 7 seconds. Repeat 5 or more times. Check out my video on my Top 3 Deep Breathing Techniques. Have you ever noticed that when you’re immersed in something you love, you tend to think of nothing else but that one thing? This is mindfulness at its best and is highly effective at reducing stress: It’s not about the past or the future, but the moment before us and the task at hand. For me, I love writing, drawing, watering my plants and cooking. Not only does the sense of focus and mindfulness help to calm us down, but being submerged in something we’re passionate about makes us feel really good. Set aside more time to do things you love! It doesn’t really matter. I’ll handle it! 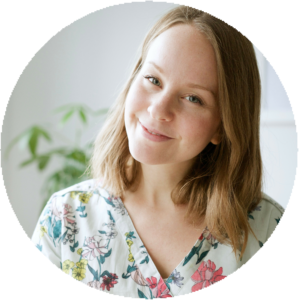 We all have different ways of reducing and managing stress, and I’d love to hear from you! Leave me a comment below with ONE way that helps you de-stress.